As per tradition the Mayor and Hastings Corporation attended Divine Service at St Clements Church in the Old Town on Sunday 12thÂ November 1916, the first Sunday after Mayor Making. The image shows some Canadian soldiers who also attended leaving the service and marching down the High Street. There is no mention in the issue of the paper who the newly elected Mayor was. The original imageÂ was takenÂ fromÂ theÂ Hastings & St Leonards Pictorial Advertiser dated 16thÂ November, 1916. This image is part ofÂ a continuing series of Then and Now images Iâ€™ve created for East Sussex Councilâ€™sÂ World War 1 commemoration website. The website is focussed on the contribution that the men and women of East Sussex made towards the war effort. This Then and Now image shows where the Old Hastings Fishmarket used to be. The Octagonal building was built by the council in 1870, and the original photo used for this image was taken in about 1890. It was built to replace the individual fish stalls that existed on the beach. The Old Hastings Fishmarket was eventually demolished in 1928 to use the space for a turning area for the trolley buses that started operating in Hastings that year. It was also in 1928 when the council started to clear out the ‘slums’ of the old town. These slums were the homes of the impoverished, and they were moved to new housing being built on farmland between Hastings and Ore – Bembrook and Halton. This marked the beginning of the clearing out of the Old Town, ending withÂ the Bourne Road being build during the 1960s. The Queen’s Head Hotel was also a pub. According to the Hastings Lost Pubs website the pub was notorious for prostitution and rowdy behaviour. Its heyday was during the second half of the 1800’s and it ceased trading as a hotel and pub in 1913. The two photographsÂ used to create the image above are below. The original photograph was taken from the East Sussex Library Flickr page. The image above shows a merge of two photographs past and present in the area near Winkle Island in Hastings. The original photograph was taken in around 1900. Winkle Island is now an open space, home to the famous Big Winkle the symbol of the Winkle Club. This club was set up in the 1900’s with the aim of supporting under privileged families in the old town. The area was the a central meeting area for many of the town’s main events including Jack in the Green and Old Town Week, until the Stade Open Space was opened a few years ago. The original image shows how far the net shops extended from Rock a Nore, and how the housing and shops extended onto where Bourne Street now is. Â Up until the 1960’s the old town’s High Street was the main thoroughfare. The rest of the old town was a tightly packed jumble of shops and housing, a small amount of which can still be seen today. Increased traffic through the area meant that the council needed to come up with a solution to the problem. Their answer was to pave over the Bourne Stream that ran through the it, and drive a wide road through the heart of the old town. I don’t know what decision making lead to that solution, however I wonder if the same one would be made today. There is a book on Amazon that might shed some light on how the council viewed the old town. This book, written by Richard Pollard is called Hastings Old Town Torn Apart 1850 – 1963 . I haven’t read it, but think I should. The two photographs used to create the image above are below. The original photo was taken from the East Sussex County Council Libraries Flickr page. The main image above can be viewed full sixe by clicking on it. Here are some photographs of the Hastings fishing boats. I spent a pleasant hour wandering along the fishing beach trying to find some interesting photos. It is hard coming up with something new in an area that has been photographed millions of times. I’m not sure I succeeded with these, but they are ok I think. The sun was setting, casting a muted golden glow and long shadows. The low sun helped toÂ highlight boat tracks in the shingle. They call this time of day Magic Hour for a reason. When you live in the same place for many years, or all of your life in my case, you can take the scenery around you for granted. Evenings like this remind me that Hastings can be a beautiful place. These photos of the fishing boats can be seen larger size on my Flickr page by clicking on them. Here are two photos, one of Hastings Beach and the other of Hastings Old Town, both processed in black and white. The hazy weather had made the colour versions of these images look a bit flat. Converting them to black and white has, I think, helped to improve upon the original image. Why do black and white images sometimes work better than colour ones? I think it is because the simplified colour scheme helps to make the image easier to process visually. It alsoÂ subtlety increases the contrast betweenÂ the light and shade. We always see in colour, so aÂ black and white image can make us pause and look closely at it. That’s my opinion what it is worth. For someone else’s read this interesting article. Both of these photos can be viewed full size on my Flickr page by clicking on them. At 1pm on Sunday the 23rd May 1943 10 Focke-Wulf 190’s dropped 25 bombs and machine gunned the town. The Swan Hotel was one of five public houses and two hotels hit by the bombs. The hotel was packed with people having lunch when the bomb hit. It caused several deaths and injuries. Among the dead were the hotel owners’ wife Grace Gummerson, theirÂ three year old son Trevor, and her sister Hilda. The image above shows the destruction caused to the Swan Hotel as workmen search for survivors after the flames died down. The search, lasting all night and the following day led to the rescue of one man and one dog. The raid was the same one that caused the damage seen in my previous post about the Albany Hotel. This information was found inÂ Nathan Goodwin’sÂ excellent book; Hastings at War â€“ 1939 â€“ 45. It is available to buy onÂ Amazon here. The Swan Hotel had been part of Hastings Old Town since 1523, originally a posting house and later an Inn it was a well known and popular focal point for the community. The siteÂ is now a memorial garden dedicated to those lost to the bombing. The two photographs used to create the above image are below. The original photo was found in the Hastings Library photo archive. This view of Hastings seafront was taken from the sandstone rocks that rise above the town. These rocks form part of the promontory upon which Hastings Castle is built. The sand stone rocks have long been popular with children and young people. The soft stone invites people to carve their names on it. As a result every reachable part of them are covered with engravings. My initials are on there somewhere. This part of Hastings seafront is really the centre of activity for tourists. There is plenty for visitors to do. The three crazy golf courses on Hastings seafront host the World Crazy Golf Championships every October. Last year fifty two competitors took part in the event. Forty eight of those competitors were British, and a British man won, proving once again that this country does produce winners. Crazy golf is not the only activity available however. Over the past two years the council has installed a multi use games area, beach volleyball court, adventure playground and a seafront trim trail. 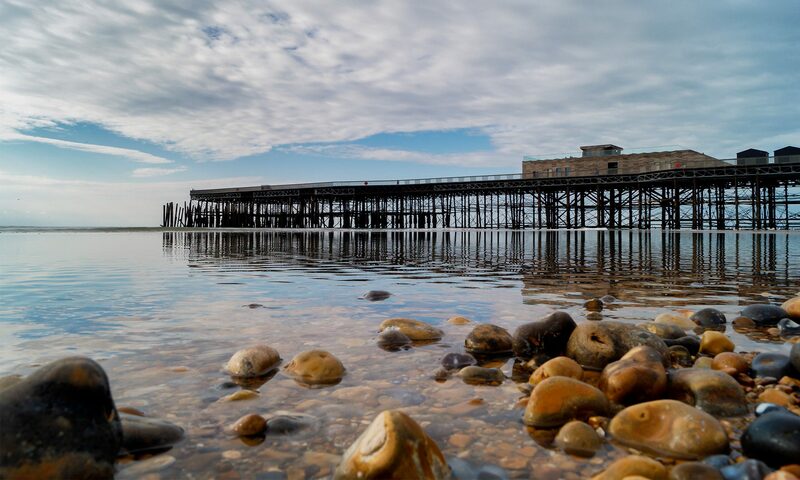 For those feeling less active there is the Hastings Fisherman’s Museum or Shipwreck Heritage Museum to enjoy. If you click on the image you can view it full size on my Panoramio page. Hastings Old Town is nestled in a valley between two hills. The stream that shaped the valley, known as the Bourne, cannot be seen as it was covered over between 1820 and 1840. The course of the stream can be seen if you look at the A259 as it runs through Hastings Old Town. Even as a resident who has seen this view of Hastings Old Town when walking over the West Hill many times, I still think that the view is very picturesque. This day was clear and sunny so I took a seat on one of the benches and took a series of 16 photos, then blended them together to make this one. The hill opposite is the East HillÂ which can be accessed by climbing the numerous steps up or by ascending in the East Hill Cliff Railway. The hill forms part of Hastings Country ParkÂ that extends from town along the coast to Fairlight. The large black building in the centre is the Jerwood Gallery. On the beach can be seen the Hastings Fishing fleet and the Harbour Arm. It is worth viewing on my Panoramio page as you can click and zoom about and see the image in full detail. Just click on the photo to be taken there. You can almostÂ imagine that you are actually sat on the bench, breathing in the sea air and looking down on Hastings Old Town.